Users who set Firefox as their default browser can use Cortana web search with whatever search engine they want, instead of just Bing. After blasting Microsoft’s attempts to set Edge as the default browser in Windows 10, Mozilla is enjoying some sweet revenge by steering Firefox users away from Bing. With the newly-released Firefox 40, users no longer have to use Bing for web searches from Cortana on the Windows 10 taskbar. Instead, Firefox will show results from whatever search engine the user has chosen as the default. The story behind the story: Mozilla may be responding to Microsoft’s own attack on third-party browsers in Windows 10, as the installation process sets Edge as the default browser for anyone who chooses “Express” settings. This resulted in a scathing open letter from Mozilla CEO Chris Beard, who said the move was a “dramatic step backwards” in respecting users’ choices. While Microsoft is clearly using Windows to establish Microsoft services, competitors like Mozilla aren’t going to let that happen without a fight. 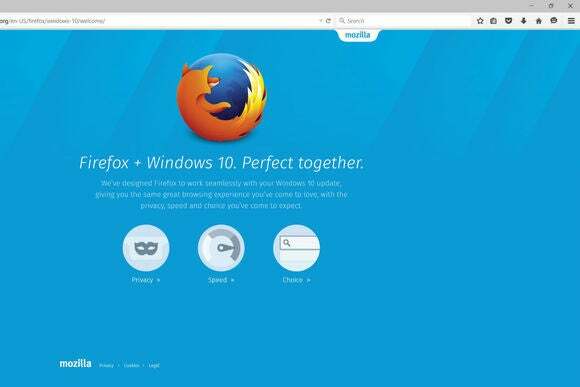 Search engine drama aside, Mozilla is embracing some aspects of Windows 10. The new browser includes “thoughtful tweaks” to the user interface, with bolder icons that are more in line with the look of Microsoft’s new operating system. Menus also take up a little less space than previous versions, leaving more room for the actual web content. The other big change is creating a controversy of its own: With Firefox 40, Mozilla is starting down a path of mandatory security checks for browser extensions. As of the latest release, users will see a warning if they try to install an unsigned extension, and Firefox 41 will block these extensions outright unless users trigger an override in the browers’s config menu. In Firefox 42, the override will go away, and all unsigned extensions will be blocked. Mozilla says the change is necessary to protect users from extensions that inject advertisements or malicious scripts, and tracking these malicious extensions from outside the official add-on repository has become too difficult. It seems, then, that even Mozilla believes the freedom to make your own choices has limits. This story, "Firefox sticks it to Microsoft, redirects Cortana searches in Windows 10" was originally published by PCWorld. Copyright © 2015 IDG Communications, Inc.